Hola! Marco Polo Plaza’s much-loved culinary journey – Sabores de España — is back! The Spanish food festival showcases once more the very best that Spain has to offer. I was late to the media launch yesterday, so I didn’t catch the ceremonial slicing of the Jamon Serrano, and the opening message of general manager Brian Connelly. Nonetheless, the mood was very festive as we went on a rich and colorful culinary journey to Spain. This weekend, September 14-16, discover Spain in the most delicious way possible at Sabores de España. Headed by Cebu’s authority on Spanish cuisine, Ms. Gema Pido, the hotel’s team of culinary experts are whipping up a delectable spread of Spanish dishes. This culinary delight will feature Spanish specialties such as jamon serrano, paella, fabadas, lengua estofados, assorted tapas, and of course Cafe Marco’s very own Spanish sangrias. Check out what the bites we enjoyed during the media launch. (P.S. The presentation may differ from the actual setup at Cafe Marco). Manchego cheese, gaaah, I couldn’t have enough! Croquetas de Pollo y Jamon (Chicken and Ham Croquettas) – I think I ate seven pieces! 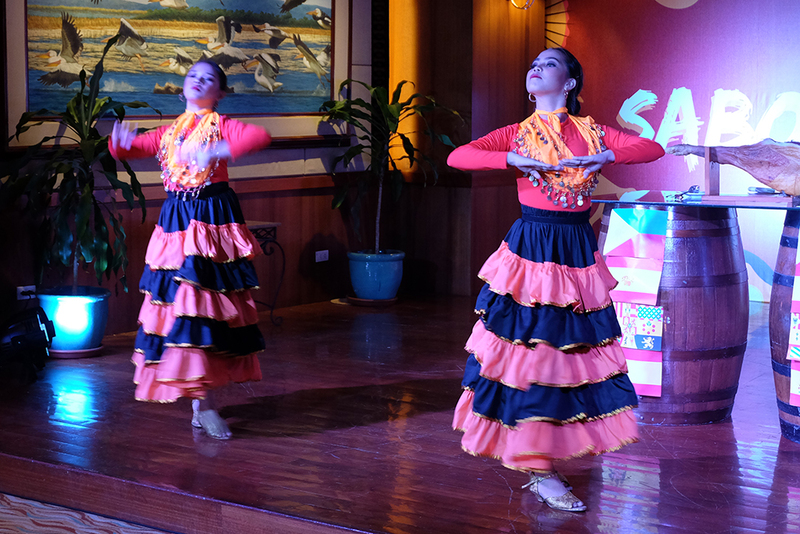 It cannot be denied that a lot of our Filipino dishes were influenced by the distinctive Spanish cuisine, so you better check it out and and eat your way through the sumptuous line-up of Spanish dishes together with Cafe Marco’s delicious spread of international cuisines.